This past Sunday, we decided to take a drive out to Hanwell to check out the new playground at the Hanwell Recreational Park. Let me tell you, it did not disappoint! If you're going to be in the Fredericton area, it's worth the short drive out. 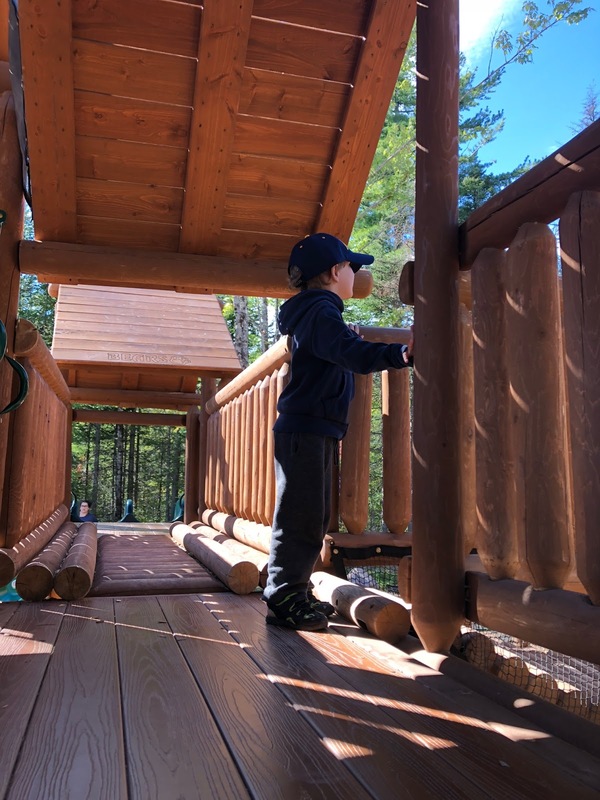 Our son loved it, and we loved the atmosphere and beautiful woodland surroundings. Although you can't tell from this photo, the park was very crowded. Thankfully there is more than enough seating for parents, and we were able to comfortably watch him play from the beautiful log benches they have around the playground. While I was there, I overheard another mother talking about how everyone from the city comes here instead of sticking to parks in their own area (seriously). She was annoyed about how crowded it was. Look at this beautiful park, guys! Wouldn't you be willing to drive an extra 10-15 minutes or more to get here? Although we are not living in the Hanwell area, we are about a 5-10 minute drive away. 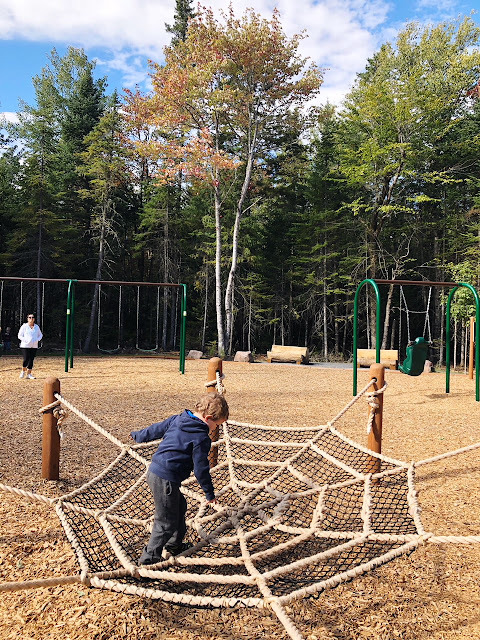 There are people who come from all over to go to various parks around the city- the parks are for everyone, and everyone deserves to enjoy it. I encourage you all to go check it out! 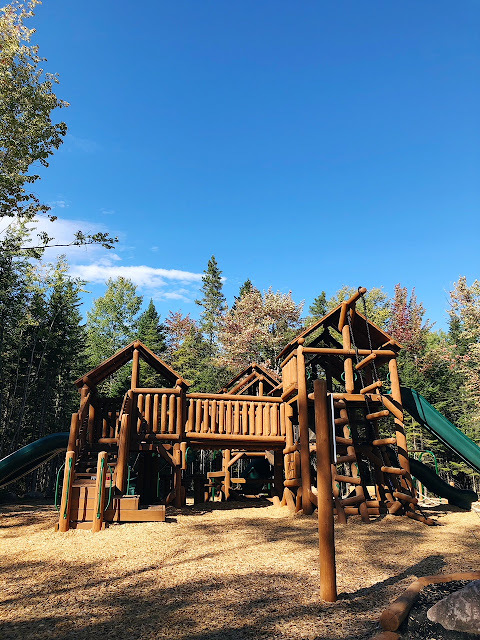 What we loved most about this park is the fact that the playground is made of wooden logs, and has a very fun outdoorsy adventure feel to it. It's unique, and we will definitely be going back. 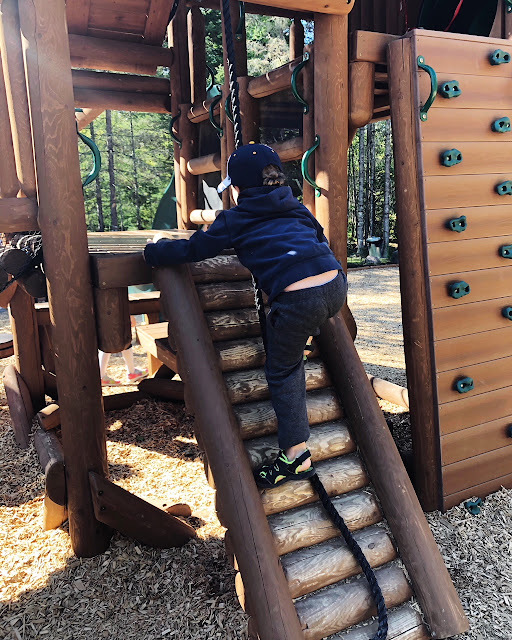 We've never been to another park that had so many fun features. 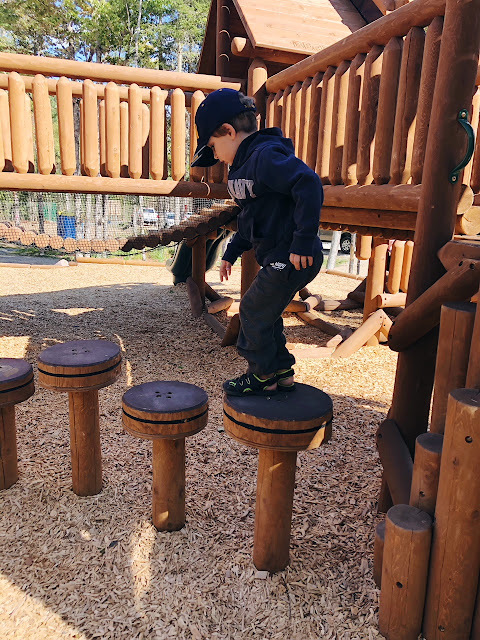 From a climbing wall, to rope ladders, to these wooden stools, there was so much for our son to see and do. Surrounding the playground are walking trails that we have yet to explore. 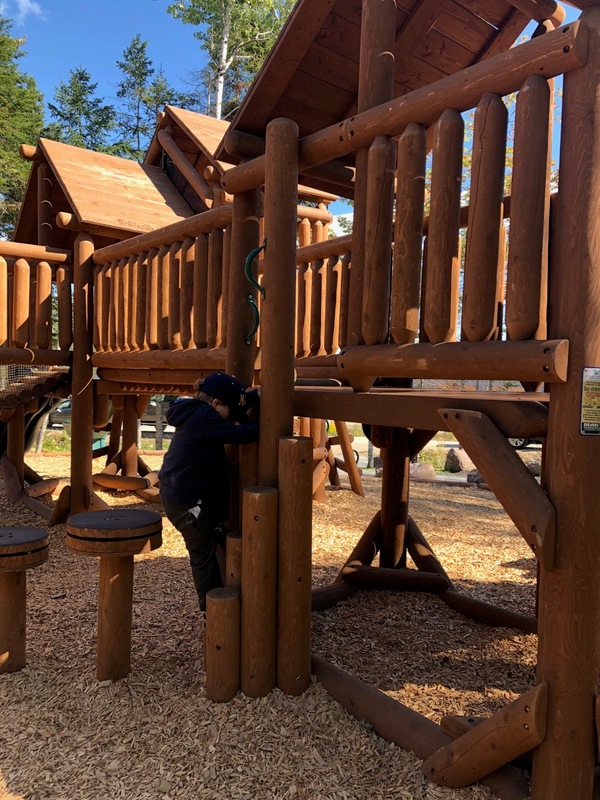 A few feet into the trail (next to the playground) is a wooden gazebo, that would be perfect for picnics and family gatherings. A couple years ago, I bought the book "Play The Forest School Way", and this is the perfect place to use it. We have some nature walks and forest school type activities planned for the near future. I also brought along some of my hand painted peg dolls for Mason to play with. He loves them, and I love how they encourage him to use his imagination. 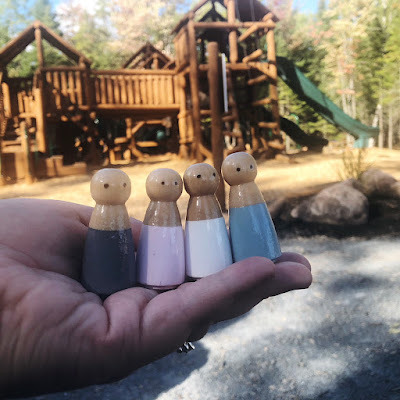 This is our Scandinavian Friends set. 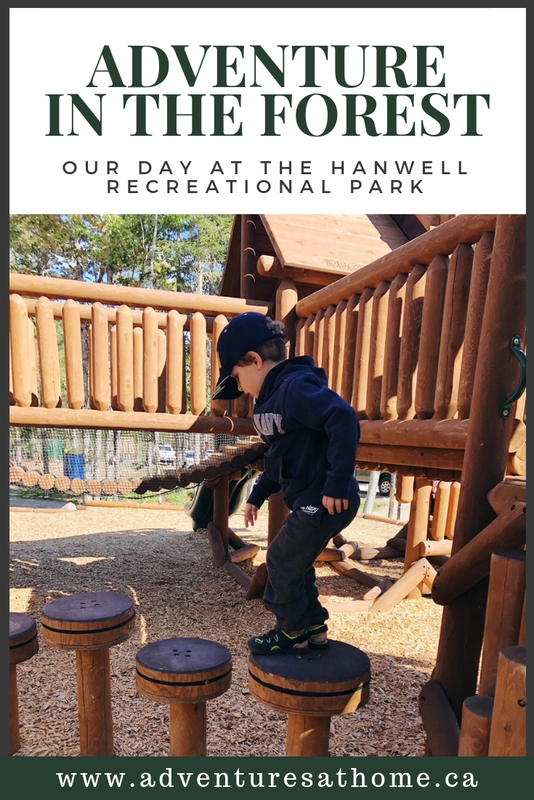 Comment below and let us know if you've checked out the Hanwell Recreational Park and playground yet!